This year’s International Engineering Trade Fair is over. Considering the number of visitors and the number of realized negotiations it is clear that the advantage of the trade fair for strengthening ZKL Group in the market with roller bearings will be evaluated very positively. The importance of this year´s trade fair was all the greater because it was hold in the spirit of development cooperation of Czech industry with India, where ZKL Group has traditionally a good position. The Czech Republic is considered by India to be very up-and-coming. Therefore during the fair there were selected several companies, among whom was also ZKL Group, which were visited by representatives of the India Government. 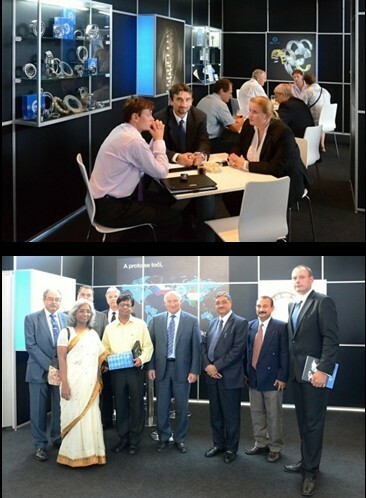 That is why the first Deputy of Indian Minister of Trade and Industry attended the ZKL stand on behalf of Mr. Anand Sharma. The fair was attended by more than 140 Indian companies. The Czech Republic, after Canada and Japan, was the third country where the India show was organized, but it was the first country where this event the Minister of Industry and Trade participated. During the visit, besides other things, Mr. Sharma dealt with the Czech president and representatives of government on development of mutual relations.